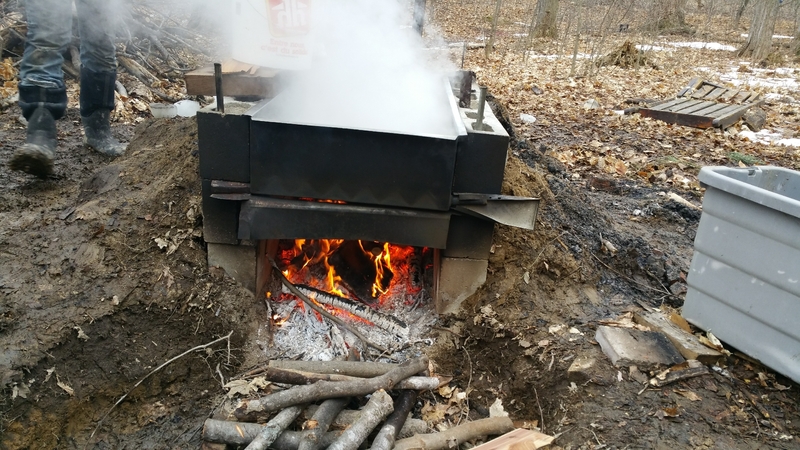 Maple Syrup on the farm! 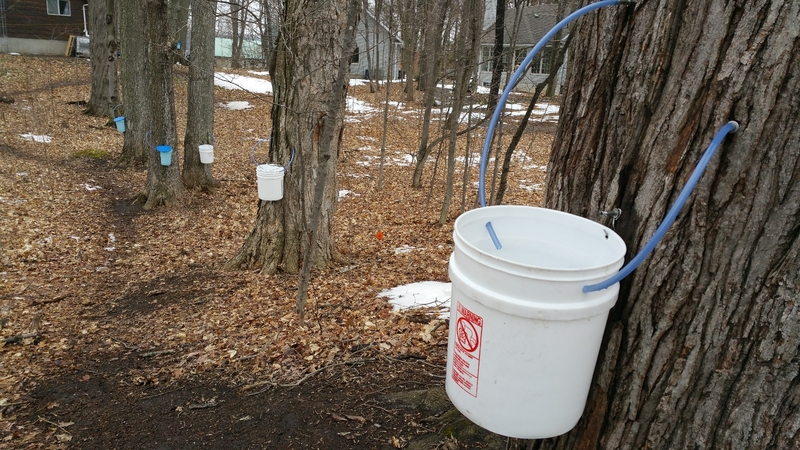 Last year at about this time, we posted about our visiting some sugar bushes as part of the big “Maple in the County” festival (see http://burkinshawfarm.com/maple-in-the-county/). This year it is a different story. 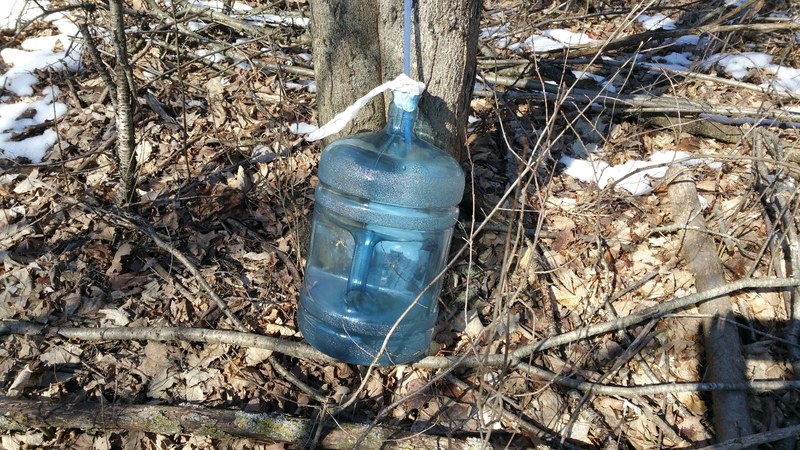 Because of Andrew’s hard work, we are able to post about our own sugar bush! It is still small scale and experimental, but a number of litres of delicious maple syrup have been produced plus some wonderful maple sugar in the shape of little maple leaves. The bigger trees, like this one, have three taps. Andrew tapped about 50 trees this year, most of them in the forest at the north end of the farm, near their house. But a few trees up near our house have been tapped. This five gallon water jug was almost filled several times. 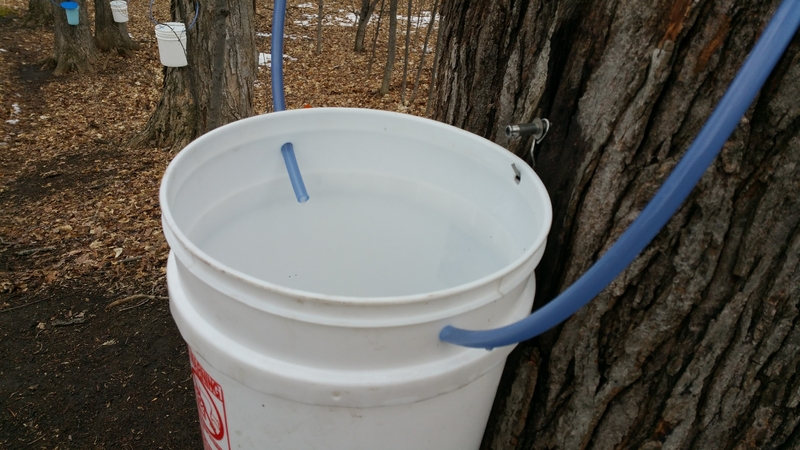 The best sap flow is on warm, sunny days following frosty nights. The evaporator is set up in Andrew & Colleen’s back yard. The fire takes a lot of wood but they had lots of branches from winter blow down and some wood a neighbour gave them. 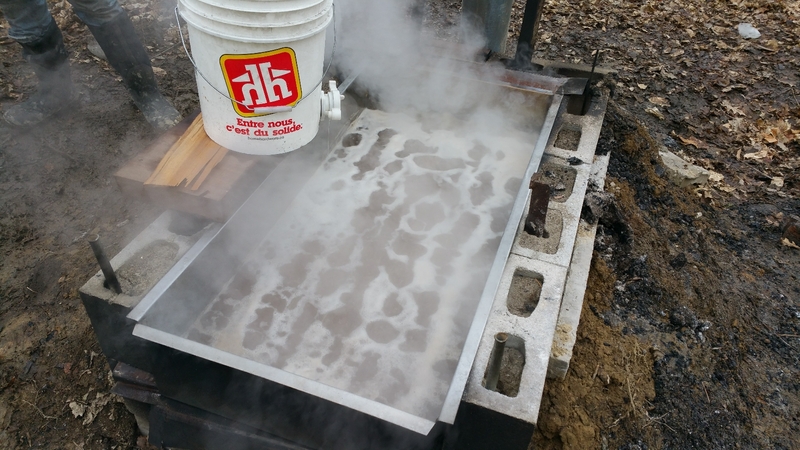 In this evaporator they have been able to process about 500 litres of sap per day and reduce it to about 10 – 12 litres of syrup. The evaporator has special ridging to aid in the process. The 5 gallon bucket to the left is full of sap which is running into the evaporator at a rate adjusted to maintain a good level of sap at a constant rate of boil. 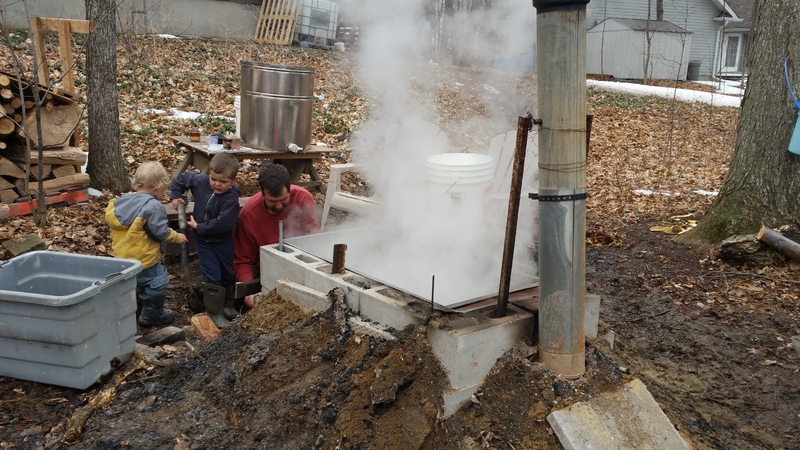 Andrew needed to do some adjusting in order to get all the smoke to go up the pipe and not come up around the evaporator and into the syrup. Isaac and Luke are eager to help! The final product! Wonderful County maple syrup. Who knows? Maybe next year there will be enough to join our growing line of farm products for sale but this year we are enjoying it for family use and as gifts. 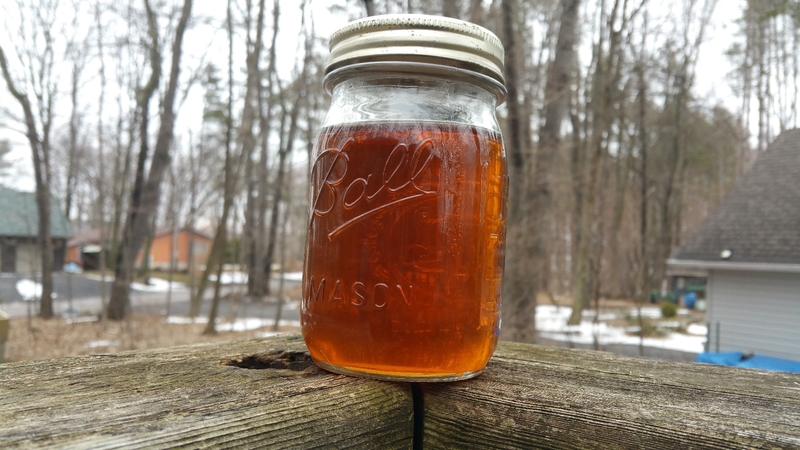 Your own maple syrup – so exciting! We want you to know that following your farm blog brings us a little vicarious “living off the land,” and a lot of joy. Keep up the good work, both on your acreage and online. I bet your already delicious waffles taste amazing with your very own syrup on them! !